I spent a good amount of time knitting Big Blue Baby Brown Penny over the weekend. Mostly during those times that we were avoiding watching the Red Sox get spanked and during whatever football game was on (they're all the same to me.) I took some photos this afternoon but she pretty much looks like she did in the photo on Friday. A couple more inches and I'll be ready to pick up for the contrast colour bands. 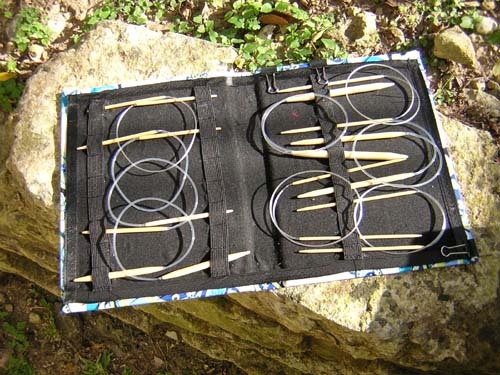 I took the afternoon off from knitting today to put together a needle case for my circular needles. 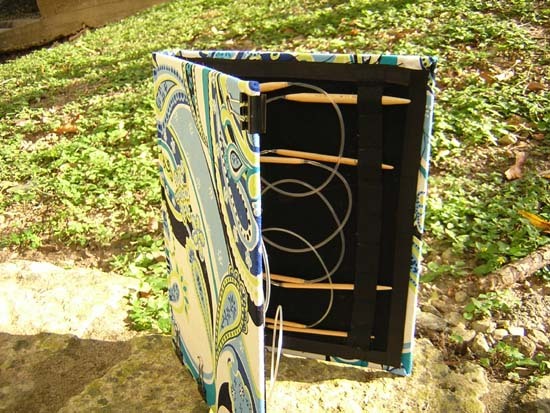 After finishing my roll up needle case for my straights, I'd been thinking of how to make a flat one for circs. I think it turned out well. It's a hardcover book that's been reconstructed. The glue is drying so I didn't put all my needles in for the finished object shot, but you get the idea. If anyone's interested I'll put together an easy tutorial for tomorrow so you can make your own delightful circular needle case. Definitely interested in that tutorial... that's just too cool! What a brilliant idea! Please give us the tutorial. I'd love to make one for myself and for some of my knitter friends. Thanks! You are so creative! I can't wait to hear how to make one. You rock!